May your day be filled with sweetness and love. Happy Valentines Day to you too! I hope you have a nice one. Hope you continue to improve and feel better with each passing day!! You'll enujoy moving to Atlanta - not only is your family here - but there is a zillion things to do!! Something for everyone! Have a great Val Day!! I'm thinking about you today and hoping you are feeling better each day! Sweet hugs and Happy V day! Happy Valentine's Day with some farmhouse hugs! Happy Valentines Day, dear Laura. So sweet! Love your Valentine Card! I hope you are continuing to get better everyday! Hugs your way! Thank you Laura! You are so sweet. HAPPY VALENTINE'S DAY!!! Happy Valentine's Day! I am also sharing vintage Valentine's Day cards today. Stop by for a visit! Happy Valentines Day back to you. What a sweet Valentine from a sweet blogging friend! Wishing you a wonderful day! 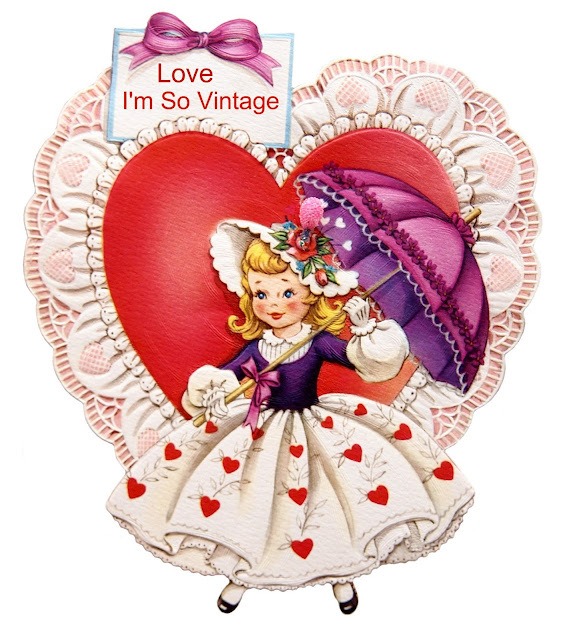 What a sweet vintage Valentine! Happy Valentine's Day! A little belated, but Happy V day to you also. I love the little girl Valentine. I have several of these that were from nursery rhymes or fairy tales which I received when I was a little girl. They often have the front and the back views. These little ladies make my heart sing. I had a great Valentine's Day. Hope you did, too.